At first, coconut and ginger might sound like an unlikely combination, but hear us out. Creamy coconut milk + nutty coconut flakes + earthy, spicy ginger = a complete flavor explosion. Go ahead, try it for breakfast. 1. 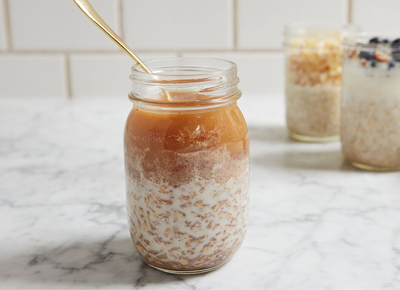 Make the Oats: In a 1-pint mason jar, mix the oats with the ground ginger to combine. 2. In a small bowl, mix the coconut milk (if you prefer a thicker oatmeal, use less milk) with the agave syrup. 3. Pour the coconut milk mixture into the jar. Screw on the lid and refrigerate overnight, about 8 hours. 4. ﻿﻿Make the Toppings: In the morning, top the oatmeal with the coconut flakes and candied ginger. Eat immediately or screw the top on and take it on the go.